Upscale Italy Vacation to Lake Como – Como, Bellagio, Verona, Venice, Milan, Vicenza, and more. NOTE: Inquire about customizing this Italy vacation package to include your desired destinations. NOTE: Arrive or depart later anywhere in Italy. We’ll make all the arrangements for you. 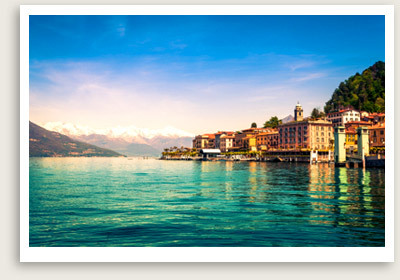 NOTE: Extend this Northern Italy Vacation Package as you please. Inquire. Note: Inquire about customizing this Italy vacation package. A private transfer from the airport in Milan is arranged to take you to Como where you will be based for 2 nights. Afternoon to Como to explore and take in the scenery. Lively Como, boasting a long history since the bronze age, has some interesting sites, plenty of cafes and restaurants. The city also has an important history in textile and silk manufacturing and trading. Interesting shopping opportunities await you. An orientation and historical walking tour of the city with a local expert guide is planned. After breakfast, you will meet your tour guide who will take you on a guided tour of Villa Carlotta in Tremezzo. This lovely villa was built in the mid-17th century and is known for its centuries-old botanical gardens and the much appreciated Italian-style garden. Important works of art are found both in the garden and inside the villa, now a museum. After the tour, you will ferry back to Bellagio, one of the prettiest village in all of Italy. Bellagio sits in front of Lake Como with its promenade, stairways and streets from the bottom to the top, lined with shops, restaurants, bars and cafes. Explore the town leisurely. You may also want a walk in the beautiful gardens of Villa Melzi which faces the lake in town. 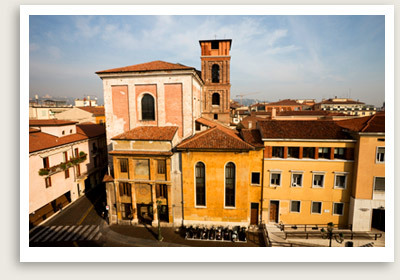 Depart from Lake Como for Verona with a stop in Milan on the way. You will have guided tour of Milan, starting with the Duomo, the city’s magnificent late Gothic cathedral. You’ll continue your walking tour of Milan through the Gallery Vittorio Emanuele II to the square of La Scala, one of the world’s most famous opera houses. You will also be treated to an private behind the scene tour of La Scala, the famed Opera house in Milan. This is an exclusive tour we arranged for you today. Your Milan tour will end at the Cenacolo Vinciano, the museum housing Leonardo da Vinci’s great “Last Supper.” (Limited tickets available. Advanced booking necessary). Your tour guide will share with you some interesting and little-known facts about this famous masterpiece. Free time after the tour to explore Milan on your own for lunch and some shopping before you head to Verona. Arrive early evening at your hotel in the city center. Ancient Verona became Roman colony in 89 B.C. It is one of the most beautiful cities in Italy which lies next to flowing Adige River. It was also the setting for Shakespeare’s Romeo & Juliet. An amazing city in every sense, Verona has luminous marble monuments that date back two thousand years. The city’s sights include a famous Amphitheater and Roman Theatre; Ponte Pietra, a centuries-old Roman bridge built over a natural ford; Gavi’s Triumphal Arch, erected to celebrate one of the most influential families in Verona; and Porta Borsari and Porta Leoni, two monumental gateways that greet visitors and depict the grandeur of the Roman empire. The fascinating remains of Roman villas and mosaics offer a glimpse of the grandeur of Verona’s Roman past. During the medieval time, the powerful Della Scala family who once ruled the city transformed Verona’s appearance forever with its fortifications, palaces, squares. Their enormous moated, fortified mid-14th century castle, Castelvecchio (now a museum), and the Scaligere bridge which was constructed as an escape route from the fortress are just two of the main sites included in your guided tour of Verona this morning. 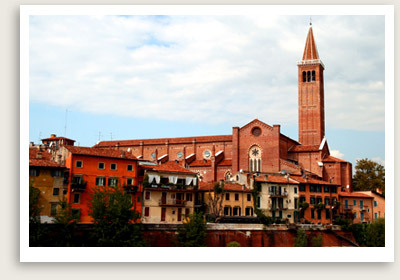 Verona is a beautiful city with upscale shops, elegant streets and squares. Afternoon at your leisure in town. Consider popping into one of the city’s several museums. A short drive away is Sirmione on Lake Garda, a popular resort town with an imposing 13th century castle. You will have time to visit the castle and leisurely explore Sirmione. You will also visit a wine producer in the Valpolicella Classico region. You will sample the regions fantastic wines like the Amarone, Valpolicella Classico, Passito and Ripasso. Founded in 2nd century B.C., Vicenza’s rich history includes many great powers – the Romans, the Barbarians, Napoleon, the Austrians. It’s prosperity under the Venetian rule generated the city’s numerous beautiful buildings and monument of Palladian architecture by the famous Renaissance architect, Andrea Palladio. These treasures along with a few villas made Vicenza a UNESCO World Heritage Site. Included in the tour is the stop in the oldest theater in the world, Teatro Olimpico, considered Palladio’s best work. After lunch and self-exploration of Vicenza, you will visit one of Palladio’s famous villa, the Villa Malmarana, with magnificent frescoes by the Giambattista and Giandomenico Tiepolo. Today, you will take the train or private transportation to the beautiful city of Venice. On this private tour of Venice, you will see three of the city’s most important sights. You will start you Venice tour in a St. Mark’s Square, the political and religious center of the Republic of Venice. You will see many of its historical and artistic treasures dating from antiquity: the Basilica with its precious mosaics; the Ducal Palace (Doge’s Palace) now a museum with its well-known Bridge of Sighs; the Procuratie palaces and the Napoleonic Wing; and the Clock Tower, the Campanile and the Marciana National Library. Your tour today includes a guided tour of the Doge’s palace and St. Mark’s Cathedral. You will have free time to explore Venice on your own and have lunch before heading back to Verona. Your private transportation or train ride will take you back to your hotel in Verona. This the end of this Northern Italy vacation. A private transfer will take you to the airport.